It's been a tumultuous year on Dalal Street. Tech stocks plunged, FMCG slipped, and generally investors took a big hit. So, just what did the roll of dice fetch for India's most valuable companies? Clue: Market cap suffered, but the usual pecking order didn't. 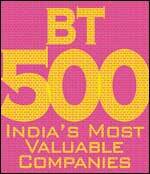 BT 500 find such prominent space in such a prominent business magazine? For years and years, Ranbaxy spoke about its transnational dreams. And of wanting to hit a turnover of $1 billion by 2004. Guess what-the dream has actually begun crystallising into reality. It has bet heavily on the US generics market, and even looks set to win. more... Will He Deliver? Are two wheelers better than four wheelers? The London-based Anshu Jain, Head of Deutsche Bank's Global Markets division and member of the bank's Group Executive Committee, was in Mumbai for a day recently. He spoke to BT about trends in global debt markets, banks' appetite for coprorate risk, derivatives and the implications for India.